As the encoder is also used not only to select an option but also to increase / decrease values, a hard stopping detent or dent can make turning the knob for long time make it hard to use... and also Rigol did not implement a good acceleration algorithm (I don't think there is one), you need to rotate it many times or use the touch keypad but sometime you don't know which value to set unless you navigate through many values. On the Keysight it is very easy to go from MHz to KHz using the knob, i.e. 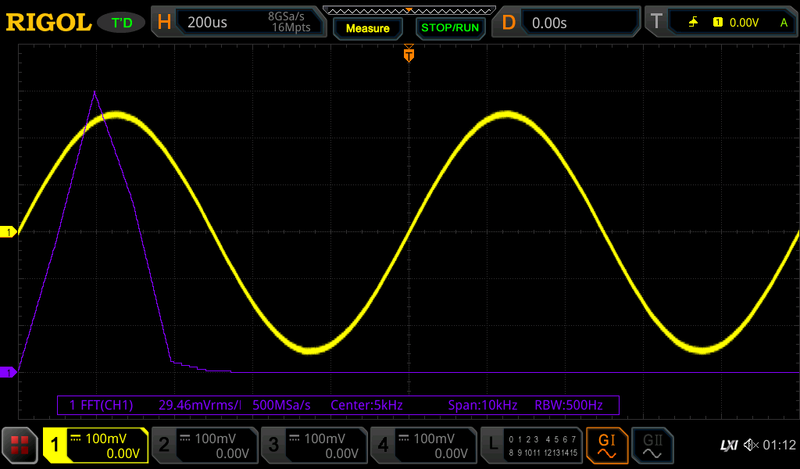 to select the output frequency of the AWG. I could not find a fine/coarse option on the Rigol knob. Photo attached of the plugs they put on 2ch model. I'm guessing they had a lot of idiots sending 'scopes back because "Two of the channels don't work! ", but those are cool. A full set of them might of them might fetch $10 on eBay. To Keep the hacking thread clean, I´ll carry on here. Quite "faster", but somewhat of a "glitch" into it. Aha, same on the lecroy..
And external termination as needed by the rigol is just crap. So looks like your's still works relatively well then Martin! Still waiting over here for an overshoot fix on a couple 5ks and 7ks. Been in contact with Rigol, and AFAIK, they're looking for a way to get the "work lab" ones done remotely if possible. The paperwork required to ship them out....would be terrifying. No word yet on just sending personal stuff in, or if the same "remote software" fix would work on the 5k too. I'm just hoping it's some special key combo or firmware that allows the full cal. Work has a full lab that'd take care of it for us. Been lucky so far all we've been doing is basic digital, but there's some fairly sensitive analog stuff coming up and I'd rather not be fighting over the single MDO3000 in our smaller group Getting more scopes otherwise takes aaaaages. 1mo ages? Nah...try 4+...on a good day. Yes, I got none of the mentioned issues so far( flickering screens, trigger problems, issue by using the averaging mode, non compensable overshoots…). True about the alignment. But it is also a compromise to ensure the buttons on the screen are taller for people who likes to use touch. Not that they are right in doing this, just a design factor which might cause the misalignment you mentioned. One last rant... you need to press the multi-purpose knob all the time, and it is prone to moving and selecting an adjacent option instead of the one you need... you can scroll and it should set the last option where you stopped when scrolling, without needing to press the knob. Just curious if those of you who have this would think its still a good buy with the firmware bugs? Are we fairly confident that they will be worked out, or will Rigol ignore these issue? For me I do - I spend 1069€ for it and it is nothing in sight which can beat it at this price. There are some annoying things which could be easily wiped out per firmware updates - Annoying, but not unable to work with this scope yet. I do have mine on work, use it daily - there was until now nothing which let me take over to another one, except tests which requires official calibrated scopes. Therefore, for me it´s still a great deal, with the hack for the full options even more. As I was for weeks in nearly daily touch with the rigol support, I got the impression they take the complaints serious. They also know this thread here. Unfortunately, it´s a common method to transform the customers to beta-testers instead of holding the new product off from the market untill it´s nearly flawless. And so do Rigol too. We don't know exact timeframes though. It triggers better than SPI, but cannot decode address and data 90% of the time. How are thresholds set for decodes? I had them set at 1.6V but somehow they got reset to 0V. Now it is decoding correctly. I've been monkeying around with XY mode and I have to say I'm not super stoked. A lot of the options that the DS1054Z had are missing. For quite a while the 1054 only had split screen mode, with no option to go full screen (added in a later firmware update). The MSO5000 is the opposite - there's no option for split screen which was handy. I also don't appear to be able to adjust trigger options while in XY. When you say 'split-screen' mode, what do you mean? The 'zoom' button does some split-screening? It sure does, but not in XY mode that I can figure out. See OP here for an example of how this worked on the DS1054Z. Apropos split-screen, this would be a feature which I want to have it on the rigol in every case. On older LeCroy waverunner models, you can choose between single-grid, dual-grid, quad-grid mode and this is sometimes very useful. Splitable screen and the possibility of "hiding" channels, that would be great to have. I don't English well. But I'm curious. Because distortion changes every time moving vertical offset. Keysight and siglent is changes. Tek and R&S is perfect. What do you think how fast screen should refresh on this FFT ? In order to have 10 Hz RBW on 10 MS/s you need to have 1Mpoints FFT. So this is FFT on 1 Mpoint. 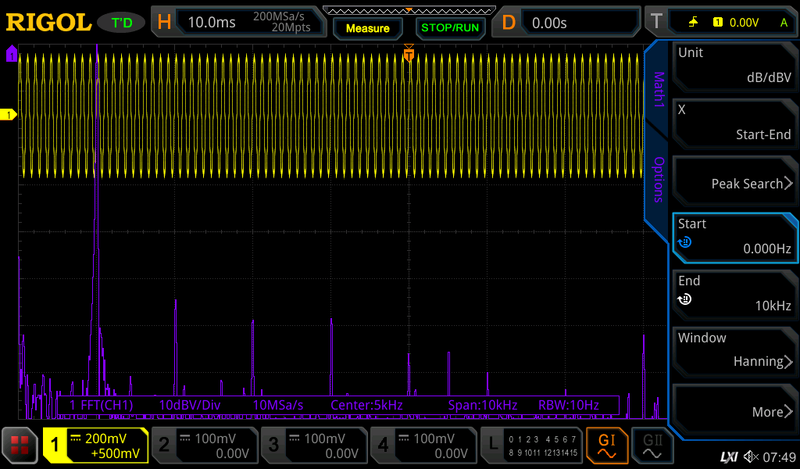 And also, in order to get 1 Mpoint at 10 MS/sec , you need 0.1 sec to acquire data for single FFT. So if FFT took no time to calculate at all, at those setting you would have maximum 10 refreshes per second. And 1 Mpoint FFT will take a bit of time. As it was mentioned many times before, measurement instruments don't measure anything. Operator does, using instruments. Know the theory, know how instrument operates and work within it's operating principles and hardware limits. Sinisa, I haven't heard that one. I absolutely love it! Does anyone know if Rigol ownership changed recently? I noticed in the back of the scope it does not say Rigol Technologies, it says Rigol (some chinese name I don't recall because my scope was returned) Technologies.